The poet Peggy Shumaker is generous. Her writing, her mentoring, her genuine ease with people, all of these she shares unstintingly. 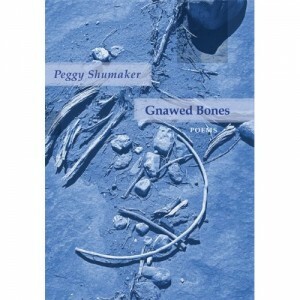 Her newest collection Gnawed Bones by Red Hen Press is infused with her generosity and a tenderness that is all-encompassing. Shumaker’s vision casts a wide net – Alaska, Hawaii, the past, the present, art, wildfire, death – nothing is excluded. In addition, Shumaker employs various forms. In some poems, short lines compress the images and the language to build tension. Others are closer to the brief lyric essays that she used in her memoir Just Breathe Normally. Although Shumaker is brilliant at the lyric, in parts of this collection she strays further along the continuum towards narrative, spinning tales of her father’s illness, his wives, her childhood, her relationship with her mother. In the poems about her own brush with death, Shumaker is at once philosophical and deeply physical. The lines in these poems squeeze the breath out of the reader, as if by such tight control, she can replicate the experience of each breath being both a burden and a wonder. To read this collection is to travel the world for a time with Peggy Shumaker, an experience which is dazzling. One emerges on the other end and closes the book with a deep breath having visited some of the more beautiful places in the world, as well as along a harrowing path of pain and healing. The grace that is so much Peggy Shumaker’s hallmark is the keystone of the collection. It is like having a tour guide who sees the world with eyes that cherish. Even pain, even sorrow is luminous when held up to the light of Peggy’s eyes. I encourage you to investigate Peggy Shumaker’s writing. I will close here with two poems that will give you the taste of the beauty in Gnawed Bones. a free ride to the other side. You can purchase Peggy Shumaker’s new book directly from Red Hen Press as well as other outlets. I will update this post with a picture of the incredible cover of Gnawed Bones just as soon as my internet host repairs their servers.